Legendary Delta bluesman's Columbia LP now on 200-gram vinyl! One of the truly great audiophile blues recordings of all time! 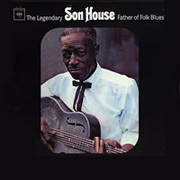 The "Father of the Delta Blues" recorded this namesake LP for Columbia Records a year later in 1965. It's become, in the words of Living Blues magazine — "Essential recordings by one of the greatest bluesmen ever." And now, Analogue Productions presents a reissue unmatched in sonic quality and luxury presentation. For our version we turned to Ryan Smith at Sterling Sound to remaster the recording from the original master tapes. The freshly cut lacquers were then plated and pressed on 200-gram vinyl by our own Quality Record Pressings. The Hybrid Stereo SACD version was authored for SACD by Gus Skinas at the Super Audio Center in Boulder, Colo.
Now, sit back and enjoy one of the genere's greatest, on a reissue that's the best that's been made to date. So authentic, so real — that's the Analogue Productions difference.